Nester's having a Fall Mantel Party! So I'll show you the mantel in my husband's study. 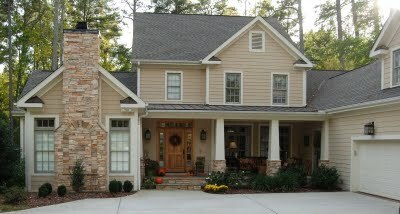 See the stone fireplace on the left in this photo? That's the fireplace for my husband's study. It's one of our favorite features in the house. Since this is my husband's space, he gets to choose what's what. He particularly likes nautical art, so he loves the framed prints in his study. As for the mantel itself, my husband wants photos of our family. I can't complain about that! So I just added a few little accessories to make it look warm and inviting for fall. I love a chair and ottoman by a fireplace. It took me awhile to find a leather club chair that would fit in this little corner but still be deep enough to accommodate my husband's 6'7" frame. This one is made by Bassett Furniture, and it's just right. Check out Nester's party for lots of mantel inspiration! GASP! I don't know that I've ever seen the exterior of your house, and I'm in LOVE. I've always wanted/dreamed of having an l-shaped home. There is something so incredibly charming about them! And don't even get me started on your fireplace! We want to do a stacked stone in our basement, and I'll be saving this to my idea file! Beautiful, Richella! Hi Richella! Oh, what a wonderful room! The fireplace is gorgeous and how very lucky your hubby is to have such a fabulous office! Your home is gorgeous!! I love your house! I've seen lots of pretty photos of this space or that, but never the full exterior. Gorgeous! And the study is wonderful! 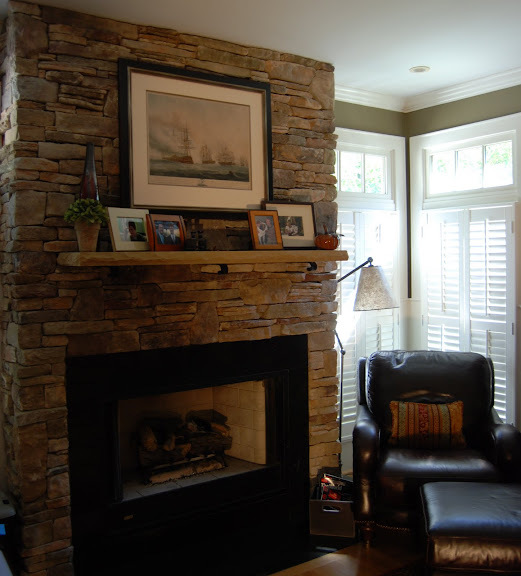 that fireplace is gorgeous... love that stacked stone stuff! and you have created a cozy space for your hubby... i love it! If we ever build a house at the lake, I want a fireplace like yours. I love it! Hey Richella you have a very interesting blog, i will visit ur blog regularly, u should go for this website to increase visitor.Happy Blogging!! !